Designing the workplace can be as exciting as it is daunting. Most business owners understand the importance of employees enjoying their physical work environment, since it helps boost productivity and overall morale. The typical employee does, after all, spend one-third of their day in the office. Already faced multiple with constraints to consider, such as budget, space, and timeline, many soft influential factors, like corporate culture and aligning the design to the work being performed, are often overlooked. While the general nature of work being performed by the company as a whole can be a major indicator of the type of office layout to pursue, one must strongly consider the individual needs and roles of each employee or group of employees. Though there may not be an “I” in team, there certainly is in “office,” and it shouldn’t be overlooked. Before you dive into the physical planning and shopping, ask yourself a few basic questions about your business and about the nature of each of the roles performed within it. Are there employees that benefit from a collaborative, open workspace, such as designers or marketing strategists? Are there employees that would prefer isolated, distraction-free work stations, such as IT personnel? Are there employees that will spend a majority of the time on the phone, so they need easy access to team leaders? Do your employees work in groups, or largely individually? Do your employees meet face-to-face with clients or customers on a regular basis? Accommodating even a few of these needs may seem challenging, let alone all of them, however; you can design the best office layout for your employees when you work with experts, and the rewards will prove well worth the extra planning. Once you’ve tackled the big pre-planning questions, where do you turn? It’s time to recruit some design assistance. When choosing an office furniture manufacturer or supplier there are several factors you’ll want to look out for to make sure you choose the company that’s right for your team. As you’ve noticed above, customization is important when adapting to the various needs of a number of unique roles within a company. When combined with physical space constraints, furniture customization options will make your life much easier. Finding that perfect office Zen may take trial-and-error over time, making rearrangeable configurations an essential requirement for your new furniture. No need to stress over installation and delivery. When you work with a one company that will organize the design, delivery, and installation of your furniture, it will save you time, money, and stress. You’re a business owner, not necessarily an interior designer, so choose a company that offers ample design assistance, whether it’s through online design or layout tools, sample layouts, design consultations, or interactive design sessions. The last thing you want is to dump all of your efforts into planning and your money into purchasing furniture that ends up falling apart on the job. Your furniture should work as hard as you do, and if it doesn’t, it should be replaced. Similarly, choose a company whose relationship extends beyond the point of sale, and will be there if problems should arise down the line. While this is largely a personal or corporate preference, it’s important to consider that products that do not emit harsh chemicals are safer and healthier for your employees, and simultaneously reduce your carbon footprint. It’s worth investigating where and how the products you purchase are made. Don’t feel like doing even more homework, trying to find the right company to design with? Don’t fret, you’ve already found it! Interior Concepts has specialized in providing customized office furniture for over 20 years. They firmly believe that cookie-cutter configurations can’t serve the majority of modern or agile work environments, and subsequently enlist design specialists to work with each client in order to provide solutions that fit every unique set of business needs. The office furniture is customizable down to the inch- meaning that you get a system built just for you! And as if that isn’t impressive enough, all Interior Concepts furniture is MAS® Green Certified and built in the United States, so you can rest assured that your work environment is safe and eco-friendly, not to mention backed by a lifetime warranty. See for yourself all the ways teaming up with Interior Concepts can empower your team. 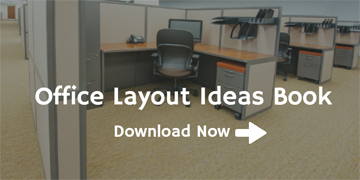 Visit www.InteriorConcepts.com to browse products, try out online design tools, or request a design consultation… or get inspired by downloading this new office design guide for some great sample workspace layouts! Cultivating a productive and harmonious work environment doesn’t have to be work; let the team at Interior Concepts help you tackle the task today!